The morning was spent with last minute errands; we were actually ready more than half an hour before son Tim came to pick us up. Flight was on time departing, and arriving in Phoenix. It is hard to imagine that I won’t be back in Indy until almost Mother’s Day! Met at the airport by longtime friends Warren and Sandy, then Mexican food dinner, of course. Promptly at 10 am picked up my bike from Southwest Bicycles, literally across the street from our hotel – unplanned convenience. With Don and Warren to do all the work, I could just supervise and give instructions (I’ll surely get my hands dirty over the next 2 months). 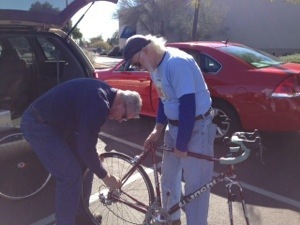 While Don went to a Cactus League ball game and to a driving range, Warren and I went out for a ride. Warren is recovering from a bike accident in November and is just back out on the roads – fine with me as I have been off the bike for a week, and just want saddle time. 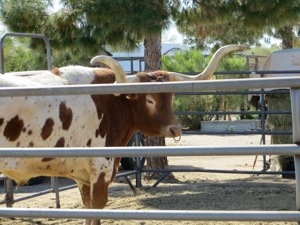 Roads are mostly flat in Phoenix area, many bike lanes, and we wandered north, stopping to check out this longhorn steer. Found out his name is Boss – I would definitely take orders from him! 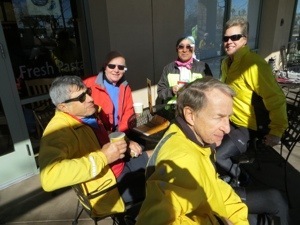 While Warren had physical therapy and Don played golf, I went biking with a group from the Southwest Bicycle Club. These are friends of Warren’s, and once he gets his strength back, he’ll ride with them on Mondays and Wednesdays. Great fun with “the boys”. We cut the ride a bit short due to the wind, but wandered south past Lucas Air Force, then parallel to I-10. They even figured a return route to take me back to Warren’s – 35 miles. Meet Yoshi, Jerry, Gene and Howie – and plenty of Phoenix sun. Back at Warren’s, he was ready to ride, so we headed back out for another 28 miles, this time with a few hills, up Jomax Road. I even did a loop up and over a crest with some fancy homes. It is especially fun to stop at Paradise (Cafe) for a cookie and lemonade along the way. Warren is my oldest biking friend – we met in the early 90s, first at a ride he led called PSFBYL (Put some fun between your legs), then on TRIRI, the Ride in Rural Indiana, where he befriended my son Tim and we linked up at the campsites. 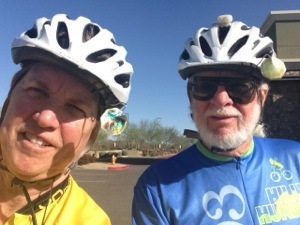 Over the years, we have taken week-long bike trips, helped each other through surgeries, and generally enjoyed each other’s company, especially on the bike. It seems so natural to be biking together – and great fun! Metric century for the day: 63 miles! Am I prepared for the miles ahead? With my biking buddy Warren. I’m continually amazed. Either of those rides would have done me in. Nice and flat and warm here. You could do some miles for sure. Thanks for following my blog, hopefully not too boring. Fun to read what you are doing Dolly. It is almost time to begin your ride across the country. What an adventure! Your blog is neat.